Dear NBC: YOU’RE DOING IT WRONG. 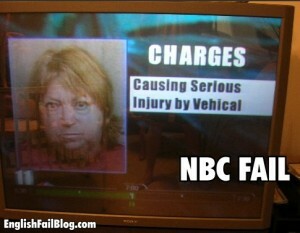 Who knew there were Google image results for "NBC Fail"? Seriously NBC? There’s so much non-trivial stuff going on in the world and you’re going to make me comment on this? Fine. Let’s explore the myriad of ways you don’t understand how ratings work. The Coles notes: Both the Detroit Red Wings and Pittsburgh Penguins have hosted free public “viewing parties” for Stanley Cup games being held out of town (or in the Pen’s case, sometimes for games in-town). This way people can still gather to cheer on their local team when there’s no chance of attending in person. However NBC is putting the kibosh to that, by not allowing either team the rights to rebroadcast their video feed for these public events. This is ostensibly to protect the “value” of their broadcast. Suffice it to say most people think this is idiotic. Ratings are only important for the former. You want the highest ratings numbers, not because it conveys a tangible benefit to you, but it makes the perceived value of you advertising slots higher. True, sometimes there are minimum targets or advertisers get their money back, or bonus’ if you reach a threshold… but for the most part there is no difference to you (positive or negative) for minor variances. If we presume that the maximum number of people who would watch a game simultaneously in Detroit and Pittsburgh could maybe top out at 30,000 (filling the Joe, and another 5-8 thousand outside in Pittsburgh – tops – that’s less than 0.03 of a ratings point (currently a single ratings point is around 1.1M viewers). This is not a statistically significant variance to influence the perceived value of your advertising. One might argue that the real issue is “share” (the total of all TV watchers at a given time tuned to a specific program), especially when broken down by region… but this ignores the second part of the “value” to the network which is actual value to the advertisers. That is to say, the number of eyebals that actually recieve an advertiser’s message. Although they certainly aren’t sharing this information with us, I have no doubt that the execs at NBC have filing cabinets full of ratios, studies, and formula to estimate how many viewers in a ratings point (or share) are actually exposed to an advertisers message. This lets them court advertisers with comparatives. “Well sure, America’s Got Talent doesn’t have the ratings of Idol… but as you can see our audience averages .5 fridges per household more than Fox’s, so our audience is 68% more likely to not miss your 30 second spot because of a beer run… that makes us a much better value per dollar”. It’s one of the reasons that so many broadcasters are getting back into live sports – viewers are far less likely to PVR/Tivo/VCR/Bittorrent live sports events and watch them later, fast-forwarding through the ads. In horrible ad-speak this is called “appointment viewing”. In this light, these live parties should be encouraged – as they are demonstrable “appointment viewing”. Ad execs should be doing cartwheels and writing press releases about how they’re delivering an absolutely captive audience to their advertisers. An audience that can’t even change the channel. Those 30,000 aren’t just “potential” exposures to advertising (like most ratings and share are)… they’re “actual” exposures to advertising… and should be considerably more valuable to advertisters. So congratulations NBC, you’ve taken a “no lose” value proposition (one that – for no effort on your part – is either neutral, or beneficial, to the value of your programming) – and managed to turn it into international ill will and consumer outrage.